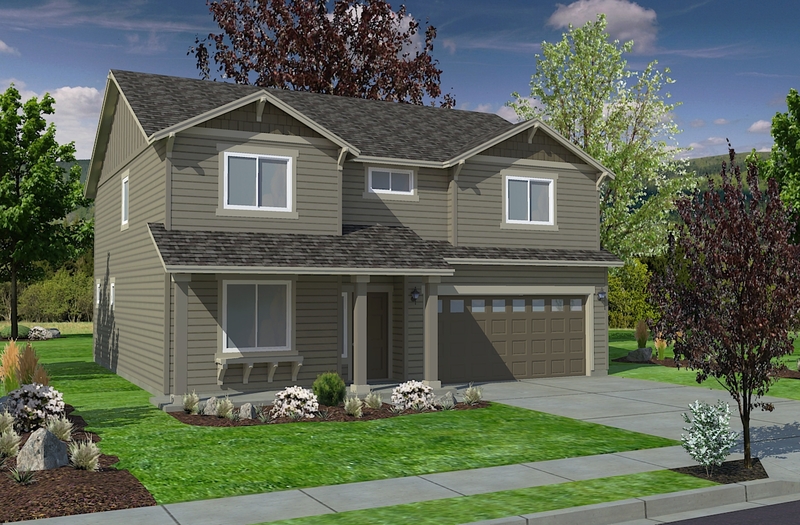 At 2267 square feet, the Tumalo is the perfect home for those in search of a new construction home that offers space and comfort in a two-story plan. The family and dining rooms share an impressive space overlooked by the open kitchen which features ample counter space, cupboard storage and a large pantry. The versatile formal living room space may be converted into an optional den or fifth bedroom – with or without a full bathroom addition. Upstairs, the expansive master suite features an oversized closet plus second closet and deluxe ensuite bath including soaking tub and dual vanity. The other three bedrooms are substantially sized with generous closets and share a central dual vanity bathroom. Simplicity Homes reserves the right to modify floor plans, elevations, materials, design and prices at any time. Dimensions and square footage are approximate. Renderings and photos are examples and may be of similar homes offered. Not all selections may be offered in all areas, see New Home Advisor for specific details. Not seeing the feature you want? Extra items for your home can be quoted. Type in your request below and it will be added to your personalized quote. Please provide your contact information so we create a detailed comprehensive quote and return it to you within 3 working days.